A tasty summer crostini with strawberries, bacon, candied pecans and creamy goat cheese topped with a balsamic drizzle and fresh basil. 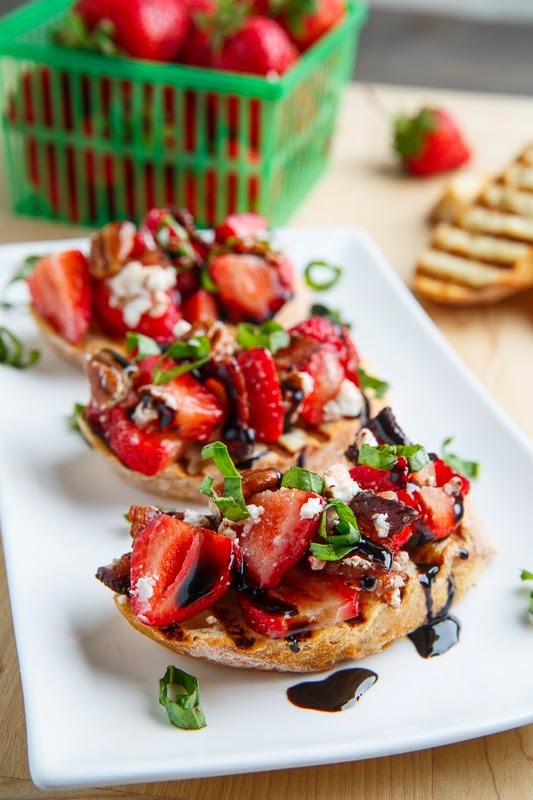 These strawberry bruschetta with bacon, candied pecans and goat cheese with a balsamic drizzle combine some of my favourite flavours and they are perfect for summer entertaining! Normally I would use these ingredients in a salad but they also work well in bruschetta form as finger food when entertaining. 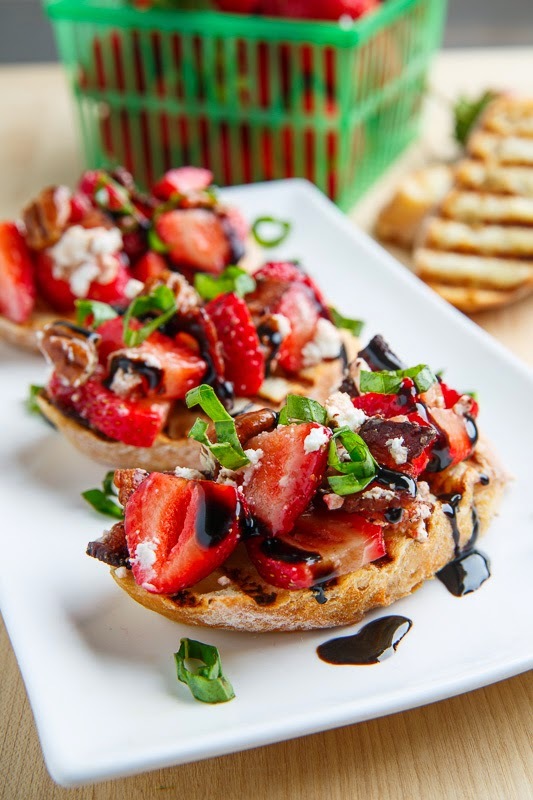 The juicy strawberries pair perfectly with the creamy goat cheese, the salty bacon and the tart balsamic vinegar and I like to top everything off with a touch of fresh basil to brighten things up! The candied pecans add a nice sweet crunch, though you could easily substitute regular pecans. Simmer the balsamic vinegar and brown sugar over medium heat until it reduces and thickens, about 5 minutes, and let cool. Meanwhile, cook the bacon and crumble it. Lightly brush the crostini with oil and toast or grill until lightly golden brown. 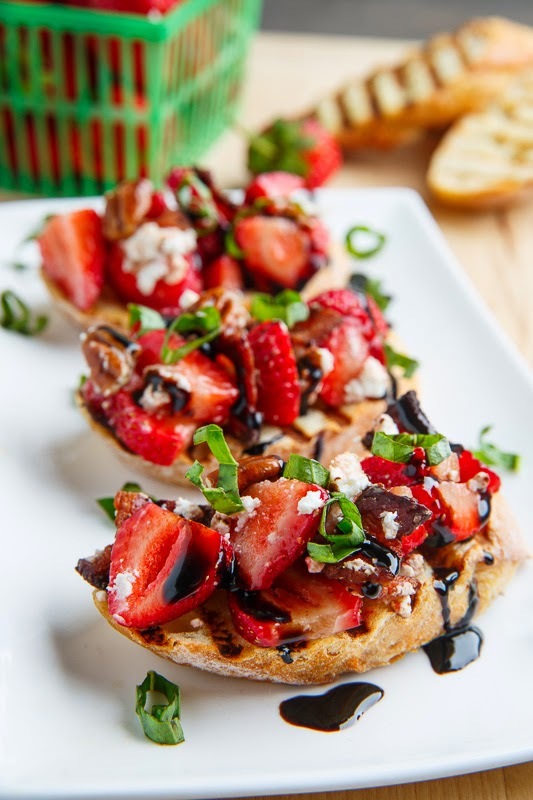 Mix the strawberries, bacon, pecans and goat cheese, divide it amongst the crostini, drizzle with the balsamic reduction, garnish with the basil and enjoy. This has a little bit of everything going on. I love the pecans! This looks like it would be a flavor party in my mouth! I'm looking forward to trying it. This is heavenly. And the colors are SO pretty! Yum! That looks fantastic! I love every single thing on there. Mmm- you had me at goat cheese! Love the combo of strawberry, basil and balsamic: I've created a similar recipe, but sweeter, with brioche french toast as the base. There's a nice theatre to it because it looks quite like regular bruschetta (with tomato) but turns out to be dessert :). Now I'll need to try your more savoury version! I've been subscribed to your blog for years – and I just want to let you know its recipes like this one that make me appreciate you so much, thank you my friend! Yumm! I've made bruschetta with balsamic roasted strawberries before, but I love the idea of adding the bacon and pecans!!! This is the best looking bruschetta I've ever seen!